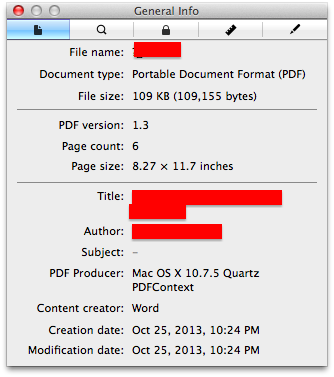 Our of curiosity, is there a way to read PDF metadata -- such as the information shown below -- from R? I could not anything about that by searching from [r] pdf metadata in the current question base. Any pointers very welcome! I can't think of a pure R way to do this, but you can probably install your favorite PDF command-line tool (for example, the PDF toolkit, PDFtk and use that to get at least some of the data you are looking for. The following is a basic example using PDFtk. It assumes that pdftk is accessible in your path. #   "InfoKey: Title"               "InfoValue: R Graphics Output"
#   "InfoValue: R 3.0.1"           "InfoBegin"
#  "InfoKey: ModDate"             "InfoValue: D:20131102170720"
#  "InfoValue: D:20131102170720"  "NumberOfPages: 1"
#  "PageMediaRotation: 0"         "PageMediaRect: 0 0 504 504"
I'd look into what other options there are to specify what metadata gets extracted, and see if there's a convenient way to parse this information into a form that is more useful for you. Not the answer you're looking for? Browse other questions tagged r pdf metadata or ask your own question.